A while ago, I was innocently scrolling through my Tumblr feed and came across an image that immediately grabbed my attention. It was a close-up shot of a woman who had the most buttery skin that I have ever seen. 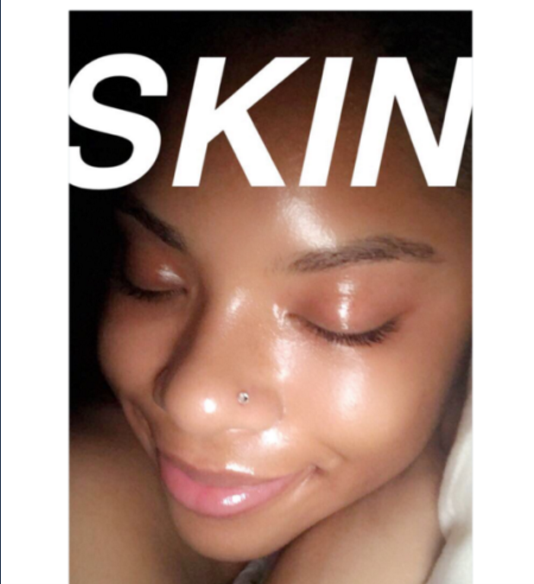 The caption of the image informed us that she was putting in serious work in order to proudly display her skin without the help of flattering filters. Filter free flawless skin. Isn't that what we all want? Of course, it is. After displaying her perfect skin on Insta, she was inundated with requests (and threats) to drop her reggie. Fortunately for us, she generously shared every product that comprised her entire routine. After careful study, I realized that most of the products used can be found in any drug store. That's promising news but I don't want that to take away from the intricate nature of her regimen. She uses "ordinary" products to create extraordinary results. First, let's take a look at her favorite cleansers. Her list includes 5 options, 2 of which are exfoliating cleansers. Clean & Clear Advantage exfoliating face wash combines the powers of micro beads to scrub dead skin with the acne fighting power of benzoyl peroxide. Using a cleanser with acne medicine is the right way to go. Exfoliating on a regular basis is mission critical if you want bright glowing skin like Ash. To ensure her skin is properly cleansed, she uses Olay's 2-speed cleaning brush. Once her skin is cleansed she tones with witch hazel (with aloe), and spot treats with Clean & Clear acne spot treatment, and tea tree oil. Ash also likes Clean & Clear's Ultra Rapid Action Pads (medicated), Differin gel, and Ambi's fade cream to even out skin tone. Last but, not least, she layers on Coppertone's sunscreen SPF 30. Side note, Meagan Good also loves acne cleansing pads and that girl's skin is unmatched. To keep her skin dewy and moisturized, Ash wears Clean & Clear's acne control moisturizer. Where were acne fighting moisturizers when I was younger??? I would have loved to experiment with a product like that in my regimen. Ash alternates her acne fighting moisturizer with a brand from Body Merry that contains retinol. This product has nearly 2,500 reviews and has a 4.5 star rating. That's pretty impressive. According to the product claims, this moisturizer will help address most signs of aging including wrinkles, fine lines, and uneven skin tone. It also contains yummy ingredients such as green tea, jojoba oil, vitamin E, B5 and shea butter. Plus it contains retinol, the over the counter version of retin A which promotes younger skin by accelerating cell turnover. This sounds like a must have moisturizer. To seal in moisture, Ash uses rose jojoba or rose hip oil. By the looks of the first image, I'd probably guess that Ash is a member of the "go to bed greasy" movement. For deep pore treatments, she relies on Aztec Indian Clay masks, Biore's deep cleansing charcoal pore strips and Epielle facial Essence (sheet) mask. To sum it up, Ash seems to be taking an aggressive approach towards acne prevention. 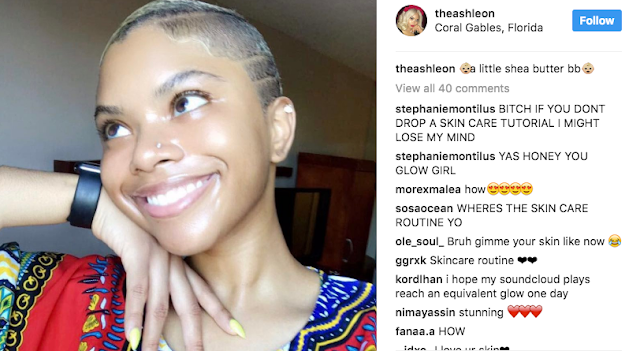 Nearly every product in her regimen is there to address breakouts. And if, by any chance, a breakout does occur Ash combines exfoliation, sunscreen and a fade cream to eradicate discoloration. Lastly, she relies on the powers of natural oils to keep her skin soft and glowing. LOL! just looked through her IG.... her photos are all tuned.... meaning skin edited. I can see she has good skin, but if she's truly gonna show untouched skin, she should do just that.